My son does that to me using Heddon Zara Spooks on my pond. He will nail the bass while I just keep trying. I usually switch to a plastic worm and catch up. Rubber worm or twist-tail jig both put up numbers for me, too, Tom. I guess I just don't hold my mouth right when I have a spoon on the line. Back in the good old days before I retired my son-in-law used to work for me after work on my bush rock business. Instead of pay I would put his wages into a fishing fund and add the same for myself, when we had enough we would book a weekend away on a fishing charter up to a coastal town called South West Rocks. The owner of the charter knew all of the best spots to get us into the action. Here's a pic of my SIL holding up a typical fish we used to encounter. I used to get a bit sea sick but it was worth it for the fun. That's a beauty Ian. What specie of fish is that? Man it's been a long time, but when I was a kid we used to go out of Garibaldi off the Oregon coast. We fished with a captain there named Ted or Ed Fisher IIRC (35 years ago...) But anyway, there was a reef there that was later named 'Fisher's Reef' for that Captain, and we caught some big ling cod there. I say 'we' but mostly it was the grown-ups as I was just a kid that wouldn't let go of my dad's coat-tail long enough to get left home. I can smell the salt air and diesel exhaust right now, as well as remember crossing the bar, lol. The nicest day I ever spent out on the ocean was out of Newport, also off the Oregon coast. I don't think there was a foot variance in the seas that day, and we fished out of my cousin's 17-foot Boston Whaler, a small craft for what can be big water. But it was beautiful that day. Idyllic, really, the water just like glass. There were four of us fishing, and I don't think there was a time all day when one of us didn't have something on. So many days fishing when someone lays into them, but the rest struggle....not this day. We hauled in blue and black bass, capezon, ling, flounder....others that I'm forgetting I'm sure. I doubt I live long enough to see another day on the ocean like that. Thanks for spurring the memory. 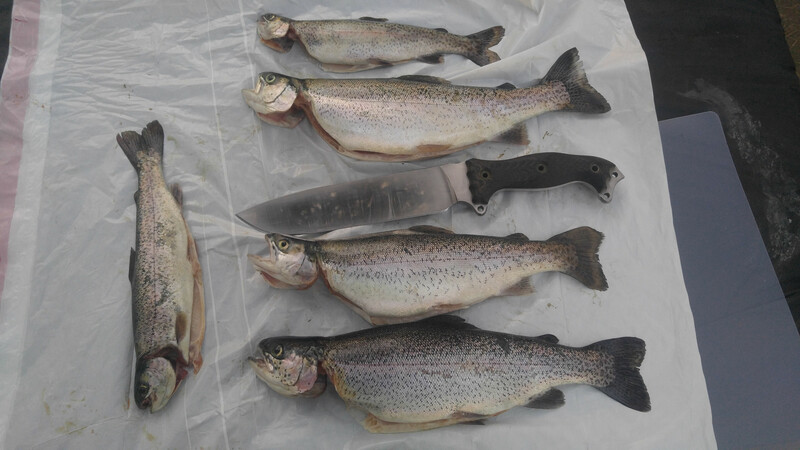 Here's a few nice trout from last summer with a NMFSH for size reference. 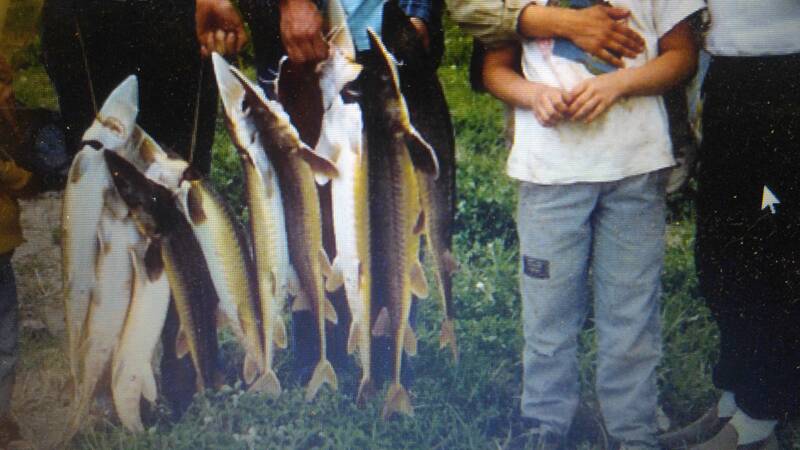 And a bunch of shovelnose sturgeon from years ago along a stretch of the Missouri River flowing through Montana. These don't get as big as white sturgeon. A 48-inch fish is very large for shovelnose in that country. 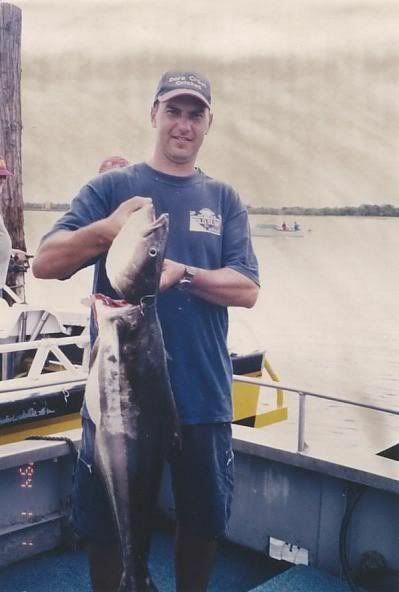 It's a Cobia or Black Kingfish, great fighters and a prized table fish. Can get a good bit larger than that one. There big fish, do you catch them by set line ? One of the hairiest fishing situations happened to me in Alaska in 1990. We were fishing along the Kenai river with my wife's uncle, who had flashlights for us in case it got too dark. We caught a LOT of salmon, and it indeed got very dark. My wife and I decided to go back up the hilly trail to the truck, and of course the flashlight was nearly dead. My wife said "if you will carry the fish and your .44 magnum, I will carry all the fishing gear". That was one HAIRY hike back to the truck, particularly because there were warning signs about bear activity in the area. Her uncle stayed on the bank fishing all night, and he said he heard a lot of sounds that kept him wide awake all night. That's enough to keep you awake all week.